A loan of $1,650 helped to buy materials and supplies such as: fabrics, collars, interfacing, embroidered badges and zippers. Adelaida is a 61-year old woman who lives in the company of her partner in the neighborhood of Cartagena de Indias. She has worked in a dressmaking shop for 25 years and learned the job from her grandmother and mother. Despite being elderly, Adelaida is very lively and energetic. She is also on the lookout for style trends to be able to satisfy her customers. Now she needs an injection of money to make uniformes and other orders. 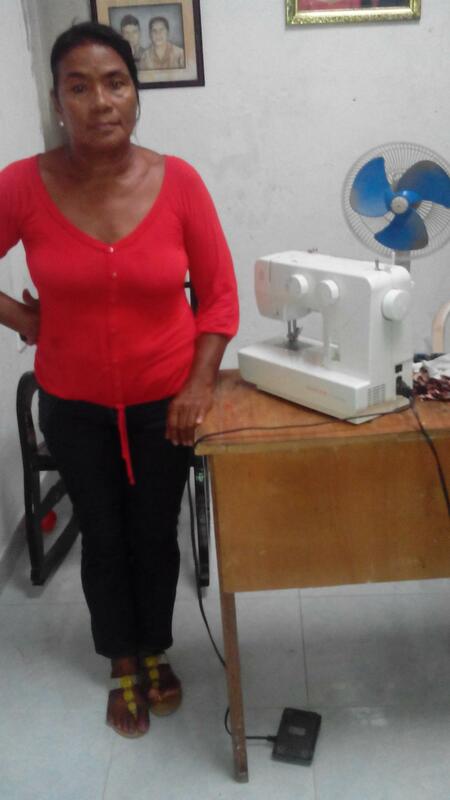 For that reason, she is applying for a Credikiva, the first funding that she has made through the Mario Santo Domingo Foundation to buy materials and supplies such as: fabrics, collars, interfacing, embroidered badges and zippers. Her goal is to have a big store where she can create employment and recruit dressmaking personnel. Translated from Spanish by Kiva volunteer Mara Nagaki. View original language description. Adelaida es una mujer de 61 años que reside en compañía de su cónyuge en un barrio de Cartagena de Indias, ella está dedicada a su taller de confecciones hace 25 años, actividad que aprendió de abuela y su madre. A pesar de su avanzada edad, Adelaida es muy vital y enérgica, además está muy pendiente de las tendencias de la moda para poder satisfacer a sus clientes. Actualmente requiere una inyección de capital para confeccionar uniformes y demás solicitudes, es por ello que está aplicando a un credikiva, primer financiamiento que hace a la Fundación Mario Santo Domingo para comprar materiales e insumos; telas, cuellos, puños, pellones, escudos bordados y cremalleras. Su meta es tener un taller grande en el que pueda generar empleo y contratar personal de operaciones de confecciones. It helps train entrepreneurs to start their own business. This loan is part of an innovative partnership between Kiva Labs and Innovations for Poverty Action to evaluate how changes to the conditions of loans might improve the impact of microcredit on small businesses and the well-being of micro-entrepreneurs. Through this partnership, FMSD is testing new features for its small business loans: the design changes being tested include lower interest rates and more flexible repayment schedules aiming to encourage productive investments and to better match micro-entrepreneurs’ irregular income flows. As part of a randomized evaluation, this borrower may be offered one of these innovative loans. This is an exciting innovation and learning process for FMSD, but—like all innovators—it may face additional costs and potential risks in the process. Funding support from Kiva lenders is therefore particularly important to FMSD on this project.